Modern awnings are functional as well as beautiful – making them the perfect way to match your contemporary home – creating shade for windows, doorways, patios / porches, decks, outdoor BBQ islands and more! The modern awning is constructed with luxe fabrics, heavy-duty metal, weather sensors and remote-controlled retractable technologies. Our contemporary retractable awnings improve the value, appearance and functionality of your home by creating additional outdoor living areas without the cost of building a permanent structure. Awnings have come a long way since ancient Egypt where woven mats were suspended over doors and windows to block the sun’s heat. Their popularity underscores both their utility and aesthetic appeal. Fast forward to the 19th century and you’ll see fixed awnings first being used commercially for the comfort of customers in shops, inns and restaurants. Operable awnings evolved soon afterwards in order to provide more control and flexibility and extend the lifetime of the canvas. 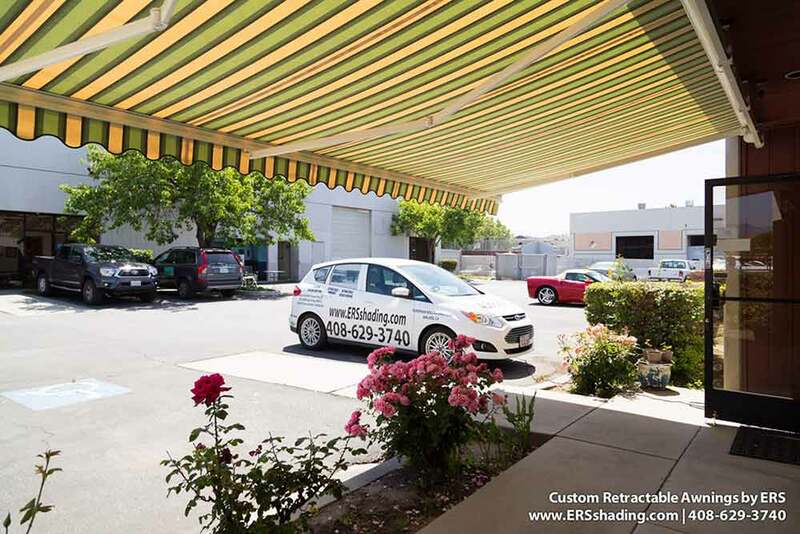 Today, motorized retractable awnings are widely used in homes and businesses not just for cooling and shading, but for increasing the home’s value and creating convenient outdoor entertaining spaces as well. The primary benefit of modern retractable awnings is that you can improve the value, appearance and functionality of your home by creating additional outdoor living areas without the cost of building a permanent structure. Bright and stylish awnings fabrics can make your monochromatic house pop with color and personality. Canvas awnings also soften the hard texture of brick and stone walls, creating a flowing, indoor/outdoor transition. Awning fabrics can be woven through the slats of your existing pergola to maximize shade and create a more contemporary look. Full-coverage, retractable pergola covers are also attractive and practical. Cheery, brightly striped Bistro-style fabrics for your porch, patio or deck awnings will make your house look cheery and inviting. Use a café awning to replace a traditional window treatment for a more dramatic impression. Installing awnings on south-facing windows can make up for insufficient roof overhang in blocking heat – with the extra benefit of breaking up straight lines with dimension, shape and pizazz. Retractable awnings too modern for your rustic home? Fixed wooden awnings add a rustic look to gardens; timber awnings glow beautifully with light fixtures attached to them; woven awnings and natural wicker make perfect patio covers in rural or coastal settings. Frosted glass combined with custom ironwork make unique and artistic entryway canopies; aluminum beam awnings add contrast and elegance to timber decks. You don’t have to sacrifice comfort for style; retractable awnings that provide shade in the summer disappear when not in use. Beauty is important, but we believe that awnings should, above all, be flexible and functional. Somfy myLink technology lets you control your motorized awnings, solar screens, pergola covers and rolling shutters conveniently from your Apple or Android smart phone. Somfy weather sensors automatically retract your shading devices during extreme rain and wind conditions, or extend them to block intense sun, without any manual or remote activation – even when you’re away from home. European Rolling Shutters offers over 150 colors, patterns and textures of awning fabric including solids, stripes, and tweeds. Our motorized, retractable solar window screens block 90% of harmful UV rays without sacrificing your view. 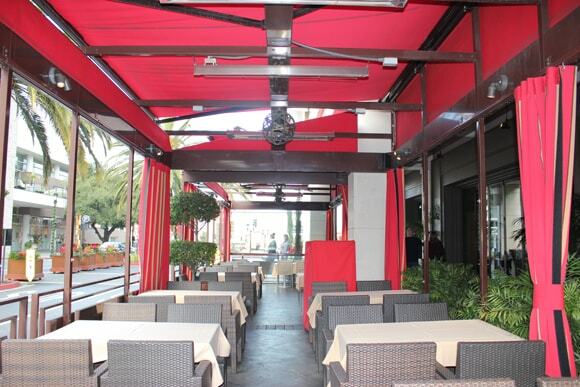 They can also be attached to the end of retractable awnings or mounted on pergolas. We use high quality aluminum to fabricate our awning frames, along with the best stainless steel connecting parts, in order to maximize the lifetime of our products. Although modern awnings come in many shapes, sizes and types, we believe the best awning provides the most functionality, comfort, energy savings and UV protection – and always looks marvelous! Our New Showroom Retractable Awning!